There are a variety of live casino games able to be accessed at online casinos, and although the main three exist in the area of blackjack, roulette and baccarat, it’s often the case that a few others are also presented as options for playing alongside these. Such products include variations on poker, with Hold’em being one of them, and 3 Card Poker being another. As noted, it’s a game which is based on the standard poker product, and it was first introduced to the gaming world back in 1994 by Derek Webb. It was at this time that he had an idea for a game which blended the excitement of poker with the speed of playing regular casino games. Whilst creating such a game, Webb wanted to ensure that there were simple game rules, large enough pay outs to attract players, and that the house edge would be large enough to entice potential casino operators. After thinking over these criteria, he came up with the 3 Card Poker product and it was almost instantly accepted as a great new game at the time. In fact, the first person to adopt the game was the Vice President of the Grand Casino Gulfport in Mississippi, Barry Morris. It would require Webb to train the dealers at no extra cost, but after standing by tables and enticing gamers to join in a few rounds, it became a quick hit with both dealers and gamers alike. Once online casinos started cropping up more and more, it didn’t take long for 3 Card Poker to make the transition across, and soon enough, online platforms soon began providing web versions of it, which was followed by the live dealer variation years later. How Do I Play Live 3 Card Poker? The live version of this game is just about the same as the land-based version, or the RNG version, in the sense that its rules generally don’t differ. However, it does, of course, allow you to play the game with an actual person dealing out the cards, rather than a computer. There are two modes of play when it comes to the game as well, which are the ‘Ante’ and ‘Play’ wagers, which play in competition on the player hand against the dealer hand. The ‘Pair Plus’ wager is paid out on the basis that the player hand will be a pair or better. Most casinos will offer both the ‘Ante’ and ‘Pair Plus’ bets as optional choices, although a few force the ‘Ante’ to be mandatory. Once you’ve placed any bets on these options, three cards will be dealt to each player and the dealer. Any players who have chosen to place the ‘Ante’ wager will then have a choice to either fold or continue, which requires them to place a ‘Play’ wager equal to their ‘Ante’. The cards are then turned over. The dealer hand needs to be a ‘Queen High’ or better for it to qualify. If the dealer isn’t able to play, there is no action on play wagers and ante wagers are paid 1 to 1. However, if the dealer does qualify, the dealer and player hands are compared. Should your hand lose, both ante and player gambles are lost. If your hand wins, both the ante and play wagers are paid 1 to 1. Of course, winning hands are those relative to well-known poker hands, such as ‘Straight Flush’ (three suited cards in sequence) and ‘Three of a Kind’ (three cards of the same rank). 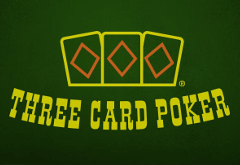 Sometimes, you’ll find 3 Card Poker games with an Ante Bonus, which is paid to the ante wager for a straight or better. This is paid out regardless of whether or not the dealer plays, and regardless of whether the dealer or player has the better hand. The ‘Pair Plus’ wager loses if you as the player have less than a pair and win with a pair or better. This pay off applies regardless of how the dealer’s hand looks, as this is not in competition with the dealer hand. Why Play This as a Live Dealer Game? It all really depends upon your own personal preference as to whether you decide to play this game against a live dealer or a computer one. Of course, playing it in live casino mode does mean that you’ll have the option of chatting with not only the dealer, but also other gamers accessing the same product. Not only that, but it does provide a sense of fair play for many people, as you can actually see the dealer handing out the cards, rather than a computerised digital game doing it for you. Furthermore, you’ll have high quality video streaming of the game in action, and through this particular feature, you’ll get to experience it as though you were seated in an actual casino establishment. Therefore, while you may be sat at home using your desktop computer, the atmosphere will scream “casino” to you.